Brenna Sherman ('19) and Rachel Schwabenbauer ('19) discuss their poster. 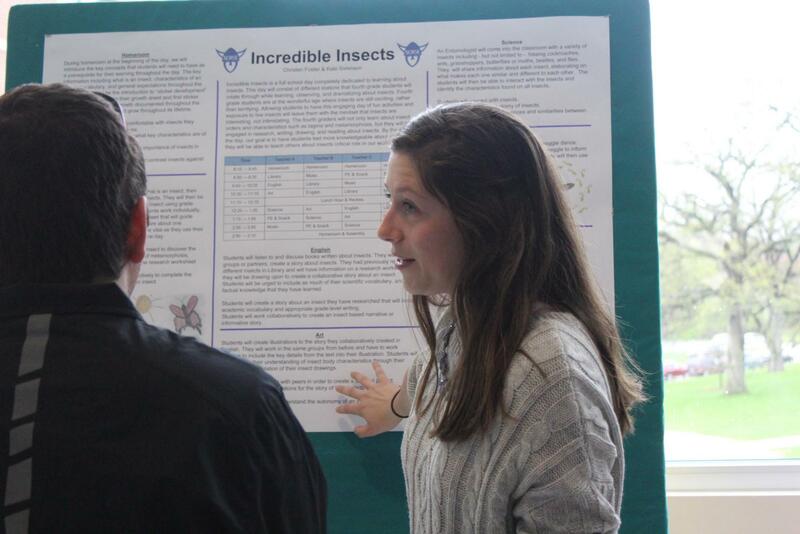 Luther held the annual Student Research Symposium and the Senior Recognition Convocation on Friday May 11. 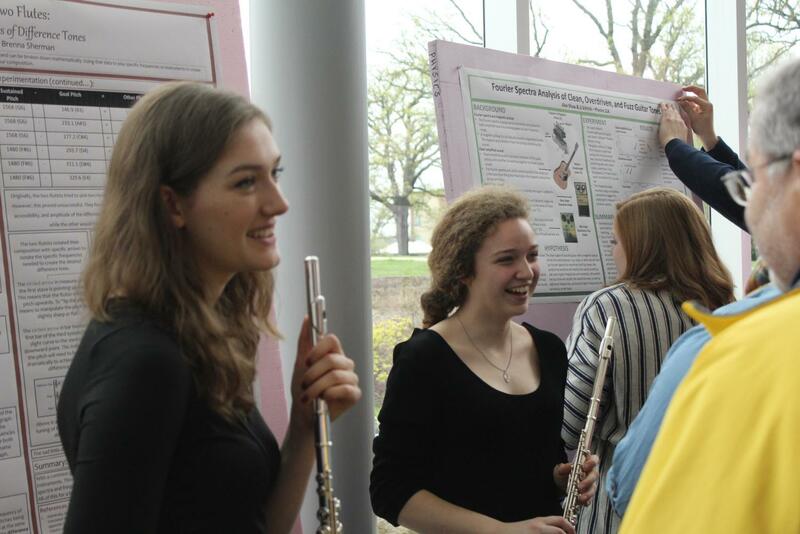 The Student Research Symposium celebrates research and creative work produced by students over the course of the year. Classes were suspended to encourage students and faculty to attend presentations from across disciplines. The day began with an opening invocation and keynote address. Nicole Weber (‘18) and Erik Floden (‘18) offered reflections on their research. In addition, the event recognized the participants of the symposium. The ceremony also showcased music from the Horn Quartet. Throughout the day students participated in research sessions, giving presentations lasting approximately 15 minutes and answering questions as a group. For many first-years, the research symposium is their first opportunity to present their Paideia research in a professional setting. Associate Professor of History and professor of a first-year Paideia section Brian Caton has a process he uses in choosing a student research project for the symposium. Kate Sorenson (’19) presents her research at the Student Research Symposium poster presentation. One student from each section presents a paper they wrote on a theme their professor decides. The idea is that students learn how to connect their personal interests to diverse topics. In the afternoon, students presented posters from specific projects or research they conducted in classes. One such class was The Physics of Sound. Lauren Bennati (‘19) enjoyed the chance to present on research she normally would not do. 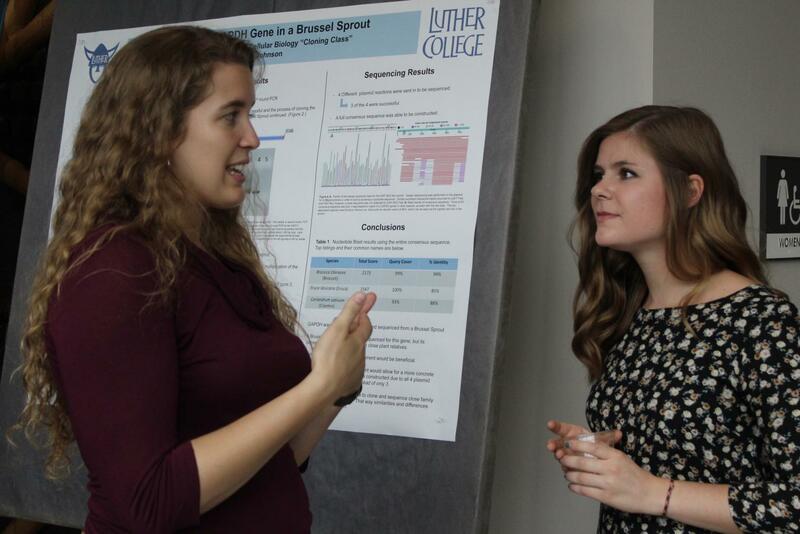 Madilyn Heinke (’19) and Nina Johnson (’19) discuss research posters. Attendee Isabel De Ayala (‘19) thought the symposium highlighted the liberal arts aspects of Luther’s curriculum.